The Chao Phraya River has long been vital to Thailand and its citizens way of life. In the past, Thai’s benefited from the river being a major mode of transportation; and equally still, the river serves as an important mode of transportation driving the economy of the country. Over the past few decades, many private corporations have begun establishing services along the river to better connect importers and exporters within the country to international shipping lines. Each of these providers have continually competed to elevate their services to better answer to their customers’ needs. Standing out prominently amongst the crowd is Sahathai Terminal Public Company Limited (Sahathai Terminal) which has rapidly expanded their services, aiming beyond just being a leading port. Nine years of organic growth have made Sahathai Terminal a fully comprehensive hub, thanks in part to the determination and visionary attitude of its founding father, Mr. Thaweesak Karuchit and his life’s partner Ms. Sauwakun Karuchit. Therefore, we were honored to speak with Ms. Sauwakun Karuchit, Chief Executive Officer, Sahathai Terminal PCL. and Mr. Banchai Karuchit, Deputy Chief Executive Officer, as they are shared with us their secrets behind a decade of successful growth and their ambition for their future. Sahathai Terminal is a relatively new company, but has been expanding their footprint rapidly to cover commercial terminal services, land transportation, warehousing and container depot services, freight forwarding and office space leasing. Currently, Sahathai Terminal operates two barge terminals and a feeder terminal, and can altogether accommodate 500,000 TEUs of containers per year. In 2015, they partnered with leading shipping line, Mitsui O.S.K. 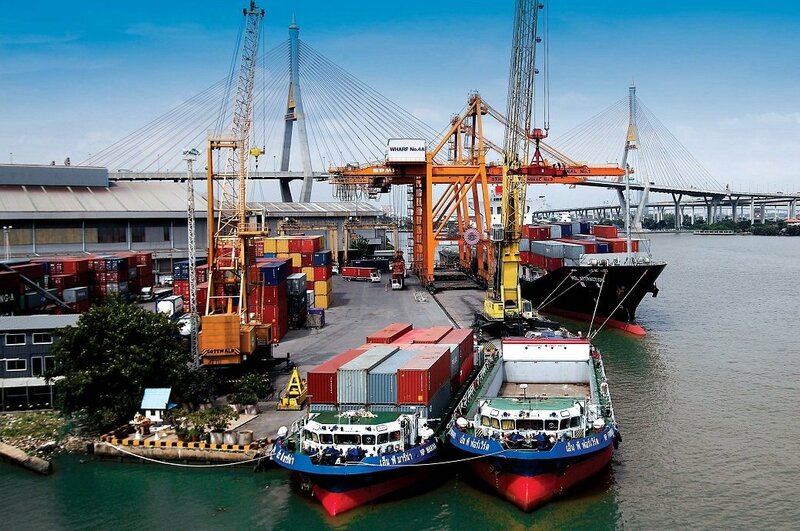 Lines (MOL) to establish Bangkok Barge Terminal Co. Ltd. (BBT). The joint venture terminal is two kilometers away from the mother port and is the first river port to be granted an ICD license. Sahathai’s commercial terminal services also covers a container freight station (CFS) and container depot services; which have been put under the management of Bangkok Container Depot Service (BCDS), a new business arm under Sahathai Terminal’s umbrella. Another factor that has driven Sahathai Terminal to be successful is the understanding and determination to improve their service. “We dedicate every day to the organization. We want everyone to grow together. We love what we do, and we care about our staff. The staff also know that we are not here just to give them orders, but to get things done. All staff are always pushing forward together towards the same goal.” Ms. Karuchit said. With the effective management that is strong from inside-out, Sahathai Terminal’s bright future is hard to discredit. They are fast sailing along the sustainable and organic growth stream, not only as a leading river terminal of Thailand, but also a dynamic engine for the growth of Thai logistics industry.